Are the best headphones for transcription especially designed for transcribers? Are they engineered the same way as recording studio or music headphones? Sometimes there’s no set standard when it comes to headphones. If you want to learn more about what you need in order to improve your transcription speed and accuracy, I have some tips and a few headphones recommendations. In my opinion, here are the top transcription headphones that have the potential to cut your effort in half. These headphones have been on the market since 1991. This is almost always a good sign. A consumer electronic product must have done something right to not get replaced by a new model every other year. Not only that but they seem to enjoy plenty of use in a wide spectrum of activities. 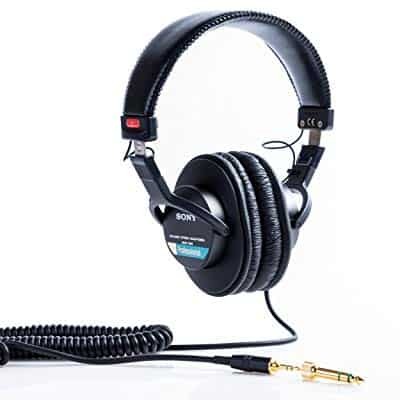 Although they’re probably most popular as studio or musicians' headphones, their balanced sound quality and level of comfort make them a solid choice for transcribers too. One of the best features about the MDR7506 is the 9.8 foot cord. It allows a wide range of movement and it’s quite durable for a coiled cord. The headphones are also foldable, so you can easily carry them to and from your office on a daily basis. The ear pads aren’t as durable as the rest of the components, but they are fully detachable and therefore easy to replace. I could tell you that the frequency response range is 10Hz to 20kHz, or that the 40mm drivers with neodymium magnets are solid, but for transcription purposes the ability to play loud is not as important as the sound clarity. The MDR7506 does offer superior quality midrange and high which means that distinguishing voices shouldn’t be a problem. The noise isolation is not exactly top-notch, but unless you’re working in an overly populated office you probably won’t have any issues. 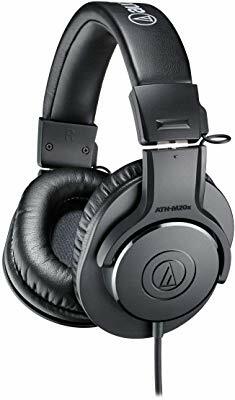 The engineering behind these headphones is rock solid, although the Audio-Technica ATH-M20Xis mostly aimed at mixing and studio recording. The good news is they are actually affordable and the 40mm drivers have powerful neodymium magnets behind them for clarity throughout the audio range. The wide frequency response range of the headphones combined with the special tuning for the low-end might give you an edge over other headphones. The good news is that the midrange and high are sufficiently balanced, so as far as transcription needs are concerned you should be covered. The noise isolation is very good at this price range. However, Audio-Technica might have compromised a bit on durability in the design of the ATH-M20X. This shouldn’t affect you much unless you’re not viewing them as entry-level headphones. I’m more experienced with studio headsets, so whenever I see earbuds I tend to be skeptical about their noise isolation qualities. But the WordSmith transcription headset is another story. First, let’s discuss the sound clarity and ease of use. This headset has a built-in volume control which will eliminate your need to tinker with on-screen settings. The cord is 10 feet long so you should be able to do various tasks on your workstation without taking the earbuds off and missing important dialogue. As far as noise isolation is concerned, it won’t be as good as a set of headphones. 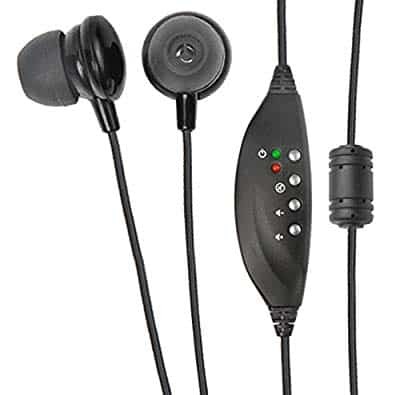 However, the design of the earbuds has a very secure fit which ensures a decent level of passive noise cancellation. In terms of comfort, I have to admit that not having a headband takes a lot of the pressure off. You can keep the earbuds in your ears for a lot longer without getting fatigued. Another added bonus is that you can connect the WordSmith to an exterior sound card through its USB cable. 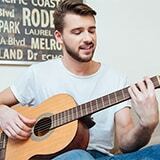 This should allow you to get an even better sound clarity and take on more difficult projects. 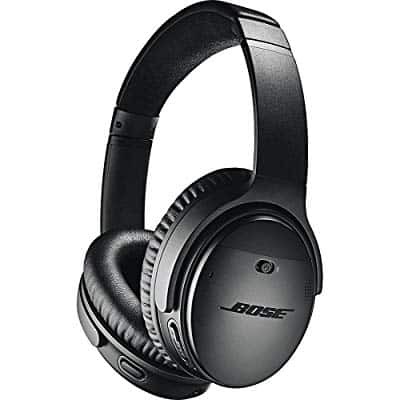 If you’re considering a pair of premium transcription headphones then perhaps the Bose Quiet Comfort 35 is for you. With these wireless headphones you won’t have to worry about mobility issues. Moving around the workstation becomes easier as well as packing and traveling with the headphones. The battery life is up to 20 hours between charges, depending on the volume setting. The headphones also come with their own app, the Bose Connect App. You will have access to all future updates too. 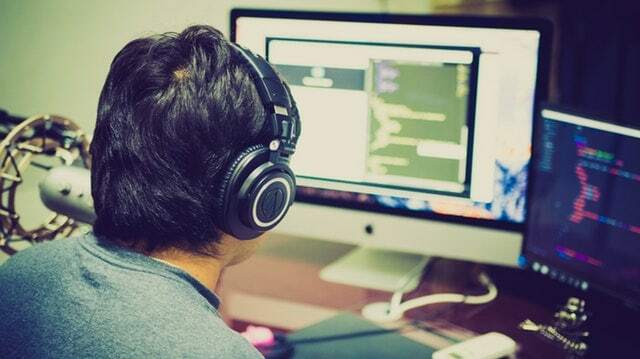 The audio is balanced for transcription tasks, which means the headphones emphasize highs and mids a lot more in order to enhance the vocal clarity. The noise isolation is on par with what you may find in high-end recording studio and mixing headphones. This allows you to take on transcription projects almost anywhere, including busy office spaces, bars, parks, as well as at home packed with screaming kids. There’s extra padding on the ear cups, but no extra cushioning on the headband. Although your earlobes probably won’t get that burning sensation after a couple of hours, you might start feeling some extra pressure at the top of your head or behind the ears if you don’t take a few breaks once in a while. 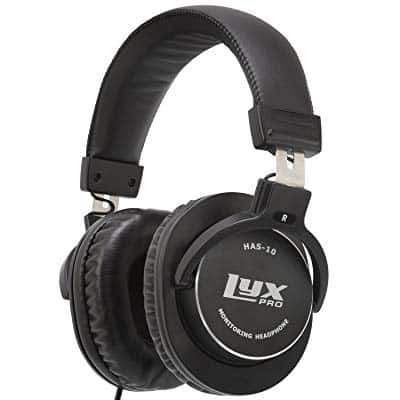 The HAS-10 headphones by LyxPro have just the type of design that promotes solid noise isolation, which should allow you to use them even in the busiest of office spaces. The soft leather padding on the ear cups makes the HAS-10 comfortable and stylish. The same type of padding is used on the headband. They will make you look like a true professional too, which is never a bad thing if you have to bring your own gear to work. The 45mm drivers with neodymium magnets offer good clarity and balance. Opting for 45mm drivers instead of 50mm shaved quite a bit off the price. With the engineering behind these studio-quality headphones, you still get something better than regular headphones in a whole slew of things, including the ability to play loud without sounding shrill and excellent dynamic contrast. If you want to chat with one of your coworkers while working you can simply rotate your ear cups. However, the durability of these headphones is perhaps the most attractive feature. For one, the jack is a screw-on design. The cable is also non-detachable so it should fare a lot better against pulls. The overall construction is a combination of aluminum and hard plastic. You will find these to be durable for the money. 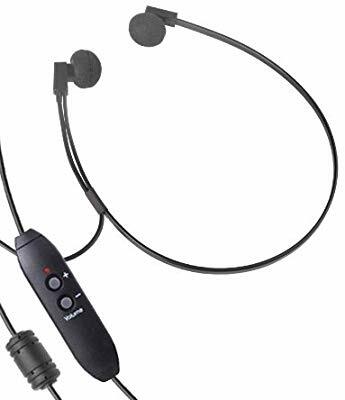 The Spectra SP is a USB headset with an extra-long 10 foot cord. Attached to the cord you’ll also find a digital volume control and integrated hardware support. If you have a subpar integrated sound card, the headset’s built-in solution should improve your performance at work. In terms of comfort, you can hardly get a better deal than not having to worry about an extra thick headband and extra pressure on your ears from large ear cups. No matter how much padding you get on some headphones, you eventually start feeling them putting the squeeze on your head. Another layer of comfort is provided by the lightweight design. Now, some of you may look at a USB 2.0 connection and deem it too slow. But as far as audio peripherals are concerned, not having a USB 3.0 or 3.1 connection will not affect the vocal quality needed for transcription. The headset is also quite user-friendly considering that the volume control has just two buttons and there’s no need to install any drivers. 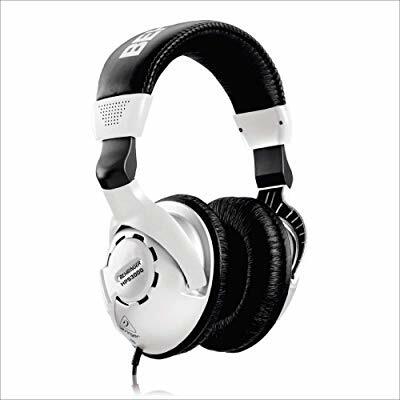 The HPS3000 by Behringer is a pair of studio quality headphones. You can choose between an on-ear and an over-ear design, which means you can have as much noise isolation as you need. Busy office space? – No problem. The headphones have a wide frequency response range and they deliver a balanced sound quality throughout the audio range. In fact, due to the studio quality engineering the bass will sound a lot better than most transcription-specific headsets. Although the sound quality is high-end, you do have to be wary about those files that have awful background noises. While you may be able to better distinguish the dialogue from the noise, too much humming or buzzing won’t get fixed without good software. The single-sided cable is of average length but it’s not as durable as you would expect by looking at the overall headphone construction. On the plus side, it doesn’t seem to tangle as easily as others. Just in case this isn’t obvious, as a transcriber you’ll be wearing your headset almost all the time. Therefore, the amount of pressure on your head and ears needs to be reduced by a large factor. Rotatable ear cups, a light weight, and even choosing an ear set without a headband should do the trick. The audio quality can sometimes be improved via software too so it shouldn’t be the first thing you look at. If you’re a freelance transcriber and you’re just starting out, you might want to invest in ergonomics more than audio quality. Staying healthy for as much as you can is essential if you’re in it for the long run. Mobility is a key feature to look for. Just because you’re a transcriber doesn’t mean you only interact with a monitor and a keyboard. You may need to move around your workstation a lot and if that’s the case, a cable could spell problems. Wireless is always the easy way to go, but wireless headphones generally cost more and may be less reliable. The only way to make a pair of wireless headphones is to have built-in amplifiers to drive the drivers. So they have to be more expensive and there are more things that can go wrong with them. Wireless headphones also need batteries to power the Bluetooth and the audio circuitry. Looking for long cables or models with detachable cables may be a safer bet if you want to keep the investment at a minimum. The cable quality is also important. Coiled cables are not the answer, but finding a cable that has extra insulation might do the trick. You basically have two choices here: USB and stereo jack. Knowing which is better for your situation requires you to know your computer’s configuration. For example, a 3.5 mm connection works great if you have an onboard sound card to plug it into. A USB connection on the other hand may mean that the headset has its own integrated sound card. Furthermore, maybe you have an exterior sound card with no headphone output. Then you’ll obviously need a USB headset. But, don’t think that USB headphones with integrated sound cards always beat an OEM integrated sound card. If you’re looking for something like that, you should expect to pay a premium of more than a couple of extra bucks. If you’re serious about improving as a transcriber, you’ll need to get your hands on the best pair of headphones. Depending on your work environment, you may need to prioritize different headphone features. My top picks discussed above all cater to transcribers, so depending on your budget and your needs you should be able to find the perfect pair for you.